Heated 14" x 24" x 9"
Unheated 14" x 24" x 9"
Its dual thermostat heating unit is buried deep within super soft orthopedic foam and is removable for year round comfort. The heater is pre?set to keep the sleeping surface 12° to 15° above ambient air temperature and warms to your kitties natural body temperature when they lie on it. No tools are necessary for installation when using the provided Velcro-style fasteners. We also include screws for a more permanent attachment. One year limited warranty. My cat is pretty large so I didn't know for sure if this would support her fully. After setting it up, I see that it gives her a good 3 inches on either side(lengthwise) and she's about 5 inches away from the edge(width wise). It's been attached to my windowsill for over a month. 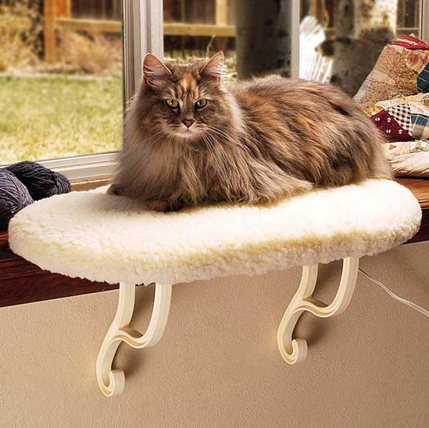 She took right to it and uses it daily for bird watching and daytime napping/resting/grooming. It supports her weight without worrying me and I only used the Velcro. A very worthwhile purchase for my sweet Eve. I'd highly recommend to any cat owner/lover.